Jazz, aka Damon Jazz, is a striking almost 3-year-old red brindle female, born August 1, 2002. 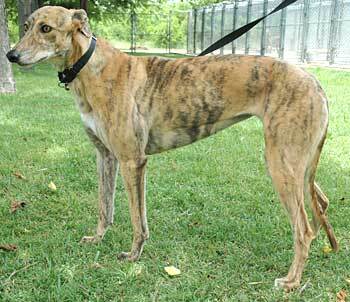 Her sire is Dark Commander and her dam is Damon Jade, making her her grand sire Wigwam Wag. Jazz's racing career was a short one - 3 races at Valley Race Park in Harlingen in February and March 2005. Here she is ready to fine her forever home! 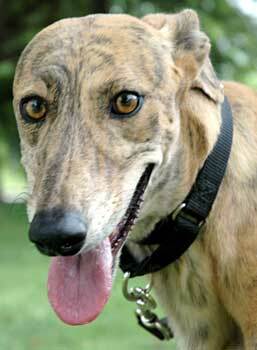 Jazz, like some of the brindles, has those gorgeous amber eyes with black outliner. It is not known at this time if Jazz is small animal or cat tolerant.